In this week's show, our host Sara Shahriari explores the complicated situation around access to affordable dental care in Missouri. Featured guests include Gary Harbison, executive director for the Missouri Coalition for Oral Health. Here is a sample of their conversation. 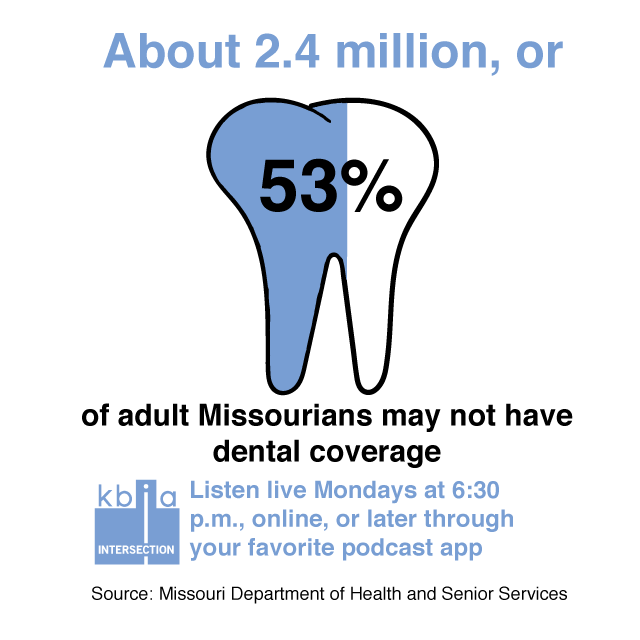 Could you give us a bit of an overview of the challenges Missouri faces when it comes to oral health? It’s a much more complex issue that most people realize. You have basically every number available that says a bad story about Missouri. We know that we’re 47th among states in access to oral health. That’s a terrible place to be for Missouri. It means a lot of people are not getting oral healthcare when they need it, and that’s very important because without good oral health, you’re not going to have good overall health. Any of the other numbers tell the same story. About the only thing we’re good at is fluoridation of public water, which is a great public health intervention. Why are so many people without dental insurance? It is not a priority for the public. It’s not a priority for policymakers. In the Medicaid program, and this is one of the issues we’ve been working on, there is no coverage for adults on Medicaid in Missouri. It is in the budget for 2016. The budget has been signed, but it hasn’t moved to implementation and there are some details as to why that hasn’t happened yet. So we’re really waiting to see if that budget goes into effect with the money for adult dental care and Medicaid? That’s right. It’s paid for by tax amnesty funds, which started November 1, but the administration has maintained that money has to be coming in before they’re going to start moving to implementation. There’s a couple of administrative pieces that will slow it down further. Dental healthcare for adults hasn’t been in Medicaid since 2005. That’s correct. It’s been many, many years. We consider the work that we’ve done, as a coalition and with our partners to get it back into the budget both for 2015 and 2016, to be a real success story. But we want to see that next piece. We want to see it be moved to implementation. How is dental care for children and young people in Missouri specifically today? We’re better in Missouri. For a long time, our Medicaid level of kids has been fairly high—that is, the poverty level that you have to have to achieve Medicaid eligibility. Matter of fact, it’s at the level that the Affordable Care Act requires for kids. However, behind that there are problems. Rates are very poor for providers. They’re unchanged for a number of years. We only have 11 percent of the dentists in Missouri participating in the Medicaid program. So, if you’re a child with Medicaid and your parents want to get dental care for you, you’re still going to have issues with accessing. Why do you think the provider rates are so low? I think the state hasn’t taken a good, hard look at what this means, that people cannot actually access care. Until they do that and pull those rates up—and there has been progress there in the past few years—but until they do that, it’s unlikely that private practitioners are going to come back to the Medicaid table in large numbers. We have had growth in federal-qualified health center dental services. They have generally prioritized children, so that’s been helpful. But they’re not everywhere and they can’t serve everyone—they’re not that big. Another thing that I’ve been reading about is that people are actually going to the emergency room because of dental problems. Could you tell us a little about that? We have lots of people go into emergency rooms for untreated dental conditions. These are not like an accident where you broke a tooth and then you go to the ER. These are situations that could have been handled if they had regular dental care. They haven’t, so they get in pain. They maybe have swelling in their face. It gets to the point where it’s intolerable and they go to the ER. Many of these folks are Medicaid folks, because they had Medicaid coverage for emergency room services, even though they don’t have coverage for dental. They go there and the emergency rooms are expensive and they don’t provide dental care. So what would typically be done is that they would do an assessment and determine, yes, this person is in terrible pain and they have an infection, so they get painkillers, antibiotics, and they’re told “Go get a dental appointment,’ which they typically can’t do. They end up back in the emergency room later. It’s a circle, because you’re not addressing the real problem. It’s about $17.5 million that they spend in the emergency room per year on that situation. Is that nationwide or just in Missouri? It is a lot of money and a tremendous amount of inefficiency in our system. To hear the rest of Harbinson's interview and more about what is being done to improve dental care access in Missouri, listen to the entire show.